Video: http://www.youtube.com/watch?v=CGFkrSLW9lE? The Nineteenth Annual Empty Bowl Benefit and Auction will be held on Saturday, April 30, 2019 from 11:30 a.m. to 1:30 p.m. at Green Valley High School (460 Arroyo Grande Blvd. in Henderson). The event is sponsored by the Nevada Clay Guild, Green Valley High School, Mission Hills Pottery and Aardvark Clay. Tickets will be $25 for adults and $15 for children and all students and may be purchased at the door. All proceeds from the luncheon will benefit the Las Vegas Catholic Worker and their soup line serving the poor and homeless. A lunch of soup and bread will be served in hand made ceramic bowls. 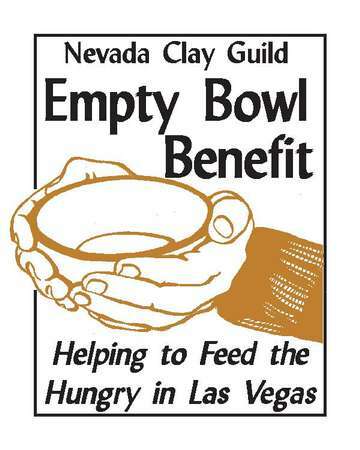 Each attendee will select their own unique ceramic bowl made by members and friends of the Nevada Clay Guild and keep it as a lasting reminder of world hunger. There will be a silent auction during the event (11:30 a.m. - 1:00 p.m. For further information, contact Julia Occhiogrosso at (702) 234-0755 (email: julia@lvcw.org) or Donna Potter at (702) 461-3398. To BUY Tickets BY MAIL with a CHECK and no fee (besides your stamp) go to: www.lvcw.org/emptybowl.htm or send check to: Las Vegas Catholic Worker, 500 W. Van Buren Ave., Las Vegas, NV 89106 (with number of tickets in memo, Adults $25, Children & all Students $15, we will send to address printed on check).